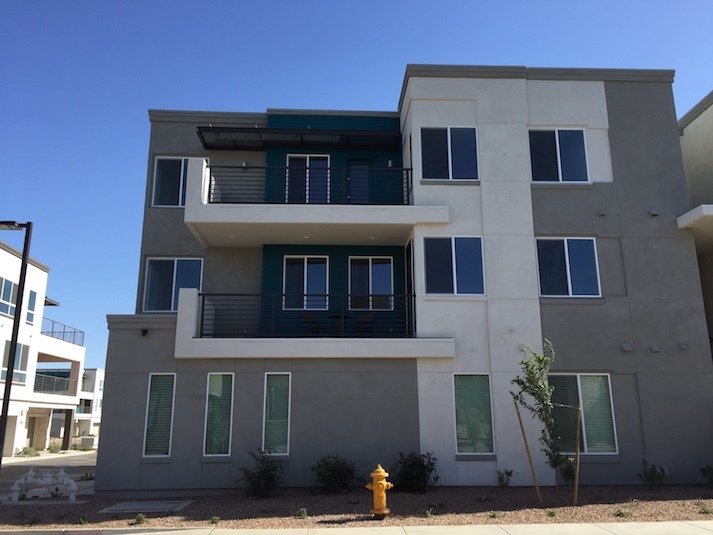 Urban living gets a welcome addition with Rhythm Condos and townhomes on the border between Tempe and Chandler. Mattamy Homes has created an interesting set of offerings that include condos and detached townhomes, all gathered around a well designed community area. And they've done it for some of the lowest prices for new construction in Tempe. Rhythm condos, starting at the mid $200's, have some unique flavor in floorplans. For those who like no stairs, there is a single level floorplan at 1400 square feet with 2 bedrooms, found on the first floor. The other floorplans are larger (1893-2173 square feet) and have living spaces on the second floor and 2 bedrooms on the third floor, with stairs down to the garage. No need to head outside to get your groceries out of the car. 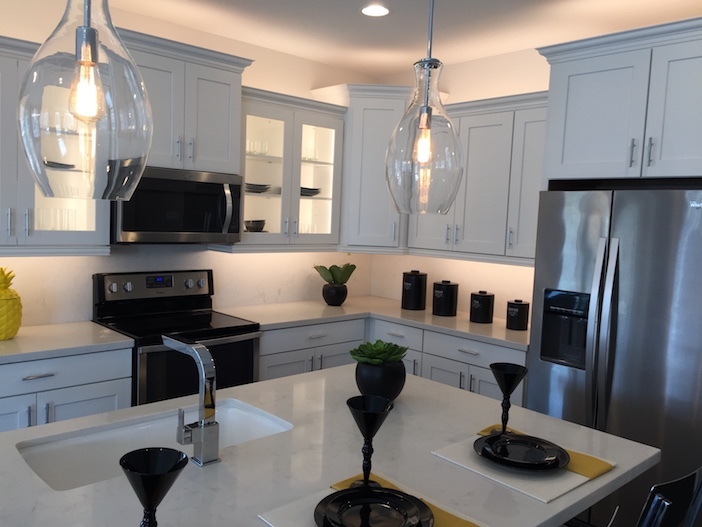 Kitchens in the condos are modern and pretty, with pendant lighting, multi-level cabinets and a breakfast bar. The living room has plenty of windows to let the light in. Some floorplans have MASSIVE decks. reminiscent of a rooftop deck but without having to climb the stairs to the roof level. If you need an extra bedroom or more space, then you'll want to check out the Rhythm Townhomes, starting in the low $300's. Located right next door to the condos, the townhomes are detached, giving residents more privacy without the front yard maintenance. These homes are 2 or 3 floors and feature 3 bedrooms and a roomy patio. 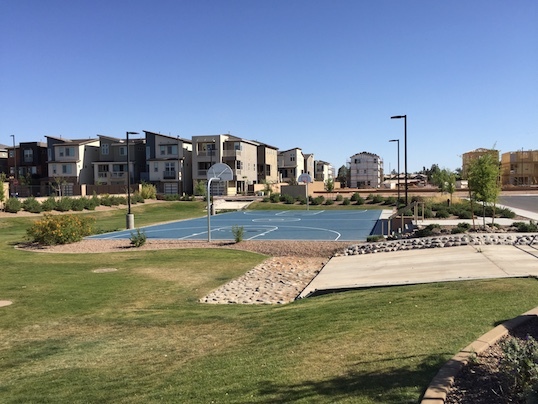 Located in the center of the development, the community center is easy to get to and has top notch facilities. The pool area has both a play pool and a lap pool with plenty of lounge chairs. There's also a shaded "cabana" area for get togethers out of the sun. The fitness center is in this same complex, so no need to spend money to join a gym. Rhythm also has a basketball court and a grass area. 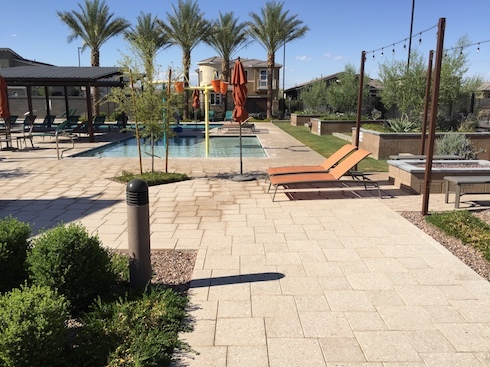 This gated community is worth a look for those interested in a new urban condo or townhome and one of our favorite new developments in Tempe. Contact us first before visiting the models to have your own representation. Looking for a patio home? Check out the communities south of Highway 60. Get your choice at Rhythm, a new development with with single level condos and three-story townhome/loft styles. The single level floorplan has a tandem garage and 1450 square feet with 2 bedrooms. The three-level styles have from 1893-2197 square feet of space, with 2 bedrooms plus loft or three bedrooms. You'll find desirable features like 18x24 inch tile, gas stove, and granite counters.